Here's another exciting story of ministry success shared by LGN member Developing Destiny. Developing Destiny has been an LGN member for two years. The goal of this ministry is to empower individuals to win in life. Developing Destiny offers a variety of avenues to its audience, allowing dreams and thoughts to be put into action. One of these avenues is Coach Allen’s Summer Camp. This camp is filled with sports related activities (Football, Basketball, Bowling, Volleyball &amp; more) and it teaches the campers the art of playing sports and the value of sportsmanship. Over the summer, Coach Allen expressed the need for a 15 passenger van to transport campers to tournaments and various events. He contacted the Jacksonville Transportation Authority, specifically the vehicle donation division. Unfortunately, Coach Allen was met with challenges which required relentless intervention from LGN. 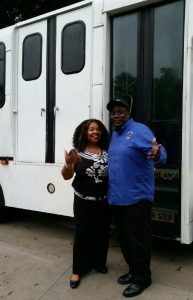 In spite of the perplexity encountered, we are pleased to announce that, four months later, the Jacksonville Transportation Authority awarded a 30 passenger bus to Developing Destiny!! Coach Carl Allen said, “The tenacity provided by Eleanor Whitfield was instrumental in obtaining the bus. We would not have gotten the vehicle without her persistence”.